Creamy cauliflower is the base for this flavorful vegetarian soup. Soaking cashews in water before pureeing gives it a luxurious, smooth texture, extra protein and a mild nutty flavor. Adding coconut milk, aromatic ginger and red curry paste yields a complex taste without adding dairy or extra calories. 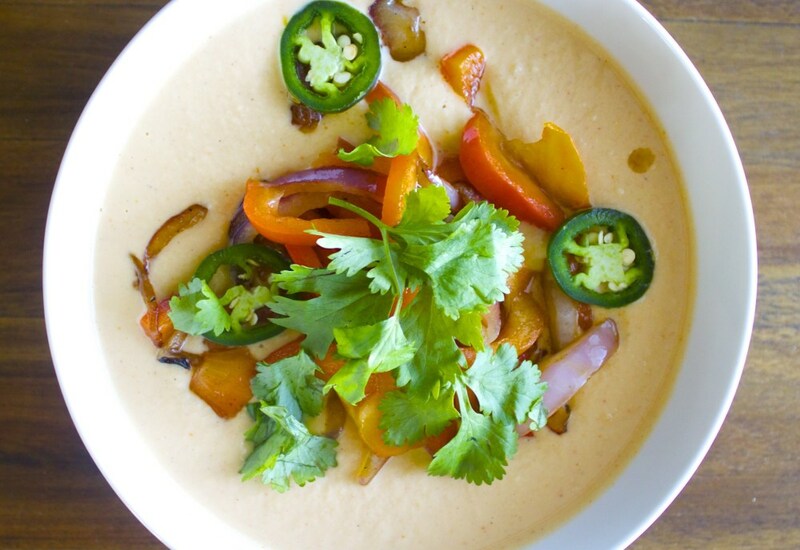 Topped with a quickly-cooked sweet peppers and onions, fresh cilantro and kicky jalapeno slices, this flavor-packed soup is a study in contrasting textures. It also happens to filled with vitamins and nutrients for a filling vegetarian or vegan meal. Make this flavor-packed soup ahead of time and enjoy for the week ahead. Alternatively, freeze the cooked soup without toppings for up to one month. Prepare the pepper-onion topping just before you plan to serve, and garnish the reheated soup with cilantro and jalapeno. Per Serving: 459 calories; 40g fat; 23.8g carbohydrates; 10g protein; 0mg cholesterol; 1166mg sodium. I loved this curry cauliflower soup! Cauliflower is so versatile, you just can't go wrong with it. The flavors in this dish were very authentic and flavorful. I loved everything about this, and will definitely make it again. I love the taste that the curry adds to the cauliflower soup. I was surprised at how creamy the texture was too. Really delicious soup.